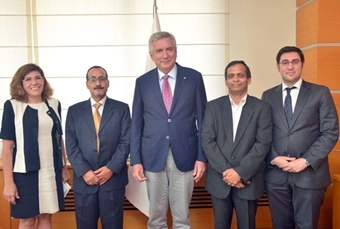 Israel’s new Undersecretary of Economy Mouneer Agbariya to take Office the 1st of September paid a courtesy visit to the ICI Chairman Erdal Bahçıvan. During the visit, attending also by his successor Joseph Avraham and the Consul General’s Commercial Responsible Murat Alfasa, the unfulfilled potential of bilateral commercial relations between the two countries has been discussed. ICI General Secretary Melek Us also participated the meeting where the main focus was to take action to enhance the bilateral commercial relations which stood around $8 billion some time ago and declined to $6.2 billion last year. ICI Erdal Bahçıvan drew attention to the balanced commerce between the two countries also underlining that the true potential of the relations could be as high as $10 billion and that they, as the ICI, were more than willing to act as a bridge between the industrialists and Israel. Bahçıvan mentioned that to this end they can organize an Israel country day in the coming months.